Or so, the calendar says. Could have fooled me. The next line to "It might as well be Spring", is, "I'm as restless as a willow in a windstorm". That's it. It seems as if we're just being blown around - teased beyond comprehension. Basta. I want the weather outside to be friendlier. The reminder that Spring really and truly is about arrive is the appearance of green vegetables from sunnier, warmer climates: artichokes and fava beans. I've had a thing for fresh fava beans ever since I ate them for the first time in Italy, decades ago, where they appeared, of all places, piled in a bowl alongside the fresh fruit that was served after dinner with cheese. What a concept. The nut-like, slightly farinaceous, fresh fava beans turned out to be just the right company for cheese - especially soft, fresh pecorino - sheep's milk cheese. However you prepare fava beans - make sure that once they're removed from their plush pod you slip their pale green skin from the bright green bean. In the Italian regions; Tuscany and Emilia Romagna, the arrival of fave happily coincides with the arrival of fresh pecorino, a young sheep's milk cheese. This simple combination can open or close a meal. 1. In a large pot of boiling water, cook the fava beans for 2 minutes. Immediately plunge them into ice water to halt the cooking. Slip the skin off each bean . Put the beans in a large bowl and add the olive oil, lemon juice, and salt and pepper to taste. Toss together. 2. Divide the fava beans equally among 4 plates. Divide the cheese among the plates. Serve at room temperature with the bread. note: If you can't find first-choice fresh favas, it's possible to find frozen ones in some Mediterranean and Middle Eastern grocery shops. Follow package directions for cooking and removing skin. I tasted frittella for the first time, in the early spring, in Sicily, when I was a guest at the agricultural estate, Regaleali. In addition the world-class wines that the estate produces, the land grows the food that supplies the large Tasca d'Almerita family, and the cooking school founded by the Marchesa Anna Tasca Lanza. One day, Anna served frittella, made with the stars of the springtime harvest - artichokes, fava beans and peas. The flavor - sweet, sour, and salty, and texture of the dish were instantly pleasurable. 1. Prepare the artichokes: cut the lemon in half. Squeeze both halves into a large bowl filled with water. Work with one artichoke at a time. Remove the outside leaves from the artichoke by bending them backward and pulling down. They will snap at the "meaty' point of the leaf. Pull away the leaves until you see only pale green ones. Cut away the remaining leaf tops. Cut the artichoke in half and use a sharp paring knife to remove the fuzzy choke. Place in the lemon water. When both artichokes are prepared, thinly slice each half and return the pieces to the lemon water. 2. In a large pot of boiling water, cook the fava beans for 2 minutes. Immediately plunge them into ice water to halt the cooking. Slip the skin off each bean. 3. In a large skillet or sauté pan over medium heat, sauté the onion in the olive oil until translucent, about 3 minutes. Add the fava beans and cook for 5 minutes. Drain the artichokes and add to the pan. Stir to combine and cook for 5 minutes. Add the peas, water, salt and pepper. Cover and cook, Stirring occasionally, until all the vegetables are tender, 15 - 20 minutes. 4. Add the vinegar and sugar, and stir to dissolve the sugar. Remove from the heat and serve hot or at room temperature. Whenever you spot baby artichokes, grab a bunch. They are so easy to prepare - just pull off a few of the tough outside leaves, cut off the spiky ends of the leaves, and cut in half. They shouldn't have a fuzzy choke, so they're ready to cook. Braise them, steam them, cook them into a risotto or, my favorite, roast them. Heat the oven to 350 degrees F., rub some olive oil and flaky sea salt on them and roast 'til crispy, about 15 minutes. I recently enjoyed roasted artichokes crowded on top of fresh, creamy goat's milk cheese that was smeared on matza. Oy, so good. One of the best ways to raise funds is to offer people tasty food, free-flowing drinks, and an opportunity to engage in conversation with other people. Last Saturday, my friend Chris & I did exactly as described. Chris, & her husband, Bert are the proprietors of The Red Barn, and they kindly donated their restaurant space so we could host a cocktail party to raise money to benefit the Hudson Children's Book Festival . The money that we raised is targeted for children who might not have the opportunity to shop, and buy a book directly from one of their favorite authors and illustrators who participate at the festival. Now, at least 200 kids will have that opportunity. While Chris & I put in some extra hours planning and making the event happen - it was kind of a no- brainer for us. Before Chris became a restaurateur (and baker - see her at the Hudson Farmers' Market) she produced commercials in NYC, and I had a catering business there for 26 years. We know how to put an event together. For my contribution to the food, I went straight to my catering menu and chose two appetizers that were unfailingly popular, and the most requested items on my list. No matter how I tried to introduce new tidbits to my cocktail menu everyone always asked for Chicken Almond Rounds and Smoked Salmon Focaccia. Chicken Almond Rounds are labor intensive. You can make them a two, or even three day project in order to ease the work load. "Before coming to Nantucket in 1953, the pioneering and entrepreneurial James Beard had a business in New York City called Hors d'Oeuvre, Inc. opened in January 1939. The shop offered New Yorkers who were entertaining - giddy with the end of prohibition - a great variety of cooked cocktail-party food. One of the most requested items on this way-before-its-time take-out menu was an onion sandwich on brioche bread. This was snack dear to Beard's heart as it was one made for him as a child by his mother. Two slices of brioche were slathered with mayonnaise, then sliced onions were placed on one slice, and the other was placed on top to make a sandwich. Three rounds were cut from the sandwich and were squeezed a bit to let some mayonnaise ooze out, then were rolled in chopped parsley. These little onion rounds gained ingredients as time passed. I learned about the Chicken almond rounds about fifteen years ago, far into their evolution." btw - James Beard's Nantucket hamburger joint was called, ahem, Lucky Pierre. 1. Place the chicken breasts in a large skillet with water to cover. Over medium-high heat, bring to a boil, with the cover askew. Lower the heat a notch and simmer gently until the chicken is opaque throughout. Remove the chicken from the liquid and let cool. 2. Place the 3/4 cup mayonnaise in a bowl, and add the celery, onion, tarragon, salt , and pepper. Stir to mix well. Break the chicken into large pieces. Working in 2 batches, use a food processor to chop the breasts until they resemble oatmeal. Add the ground chicken to the celery mixture. Carefully combine with a rubber spatula. 3. Line up 4 bread slices at a time. Spread each slice with some of the chicken mixture, forming a layer 1/4 inch thick. Cover each slice with a second slice. Repeat until you have 12 sandwiches. Using a 1 1/2-inch-diameter biscuit cutter, cut out 4 rounds from every sandwich, gently pushing them free from the cutter after every two cuts. Keep the pairs of rounds stacked together and cover with damp paper towels until all of the sandwiches are cut. 4. Pour the chopped almonds into a baking dish or onto a dinner plate. Holding a stack of sandwich rounds between thumb and forefinger, spread a film of mayonnaise around the cut edges. Roll the stack through the chopped almonds until the edges are completely coated with the nuts. Re-cover the stacks with the damp paper towels until all are coated. 5. To serve, separate each stack back into two sandwiches. Day one: make chicken mixture and refrigerate. Day two: make the sandwiches and cut into rounds. Day three: roll the sandwiches in the nuts. It had to be the snowiest day in a while. The stuff was gushing out of the sky in big wet drops - and sticking - oh geez - sticking. But I had a date - a date for lunch at the new Bocuse restaurant, named for the legendary French chef who is considered, among other things to be the creator of novelle cuisine , at the Culinary Institute of America - the CIA in Hyde Park, NY. Nothing was going to stop me. Allegra (now why would I schlepp a dog along?) & I took off down slippery route 9 in my Subaru Forester - and true to its publicity - all its wheels were on the road, working like crazy to keep us from sliding off. We arrived, miraculously, just a few minutes late. My dining companion, CIA graduate, food writer, blogger, Marissa Sertich, was at the table, with its stunning view of the snow-blanketed Catskill mountains and the icy Hudson River, waiting with a smile. Now, before I go any further - you know that the Culinary Institute is a school, and all of its 5 restaurants, from a cafe, The Apple Pie Bakery, that serves sandwiches, soups and salads to the utterly elegant - worthy of competition from any big city 4 star restaurant - Bocuse are student operated - with a little help from their chef/professors. The waitstaff are students - all eagerness and grins. We ordered a prix fixe meal that included an appetizer, entree and dessert. We each ordered soup to start. I couldn't pass up the opportunity to taste one of chef Bocuse's signature dishes, Soupe aux Truffes V.G.E. The chef created the dish when, in 1975, the French president, Valery Giscard d'Estaing awarded him the Knight of of the National Order of the Legion of Honor. The soup, beef broth with a tiny dice of vegetables, and slivers of black truffle was served in its own Bocuse-designed tureen, topped with puff pastry, then baked. Crack open the egg-glazed topping and inhale the unmistakable aroma of truffles. Marissa had lobster bisque, deconstructed, and served with snowy foam that mirrored the outdoors. Entree choices were straight out of the classic French kitchen. I had lemon sole with lemon sauce and steamed vegetables. Marissa's duck a l'orange was a modern version of everyone's favorite - 1950s-1960s dinner party meal. They were all well-executed, tasty and attractively presented. Dessert. Oh gosh. Dessert is almost always my preferred course. I usually ask for the dessert menu at restaurants before I order my entree. Wouldn't want to spoil my appetite for dessert! Marissa told me the the pastry chef/instructor was famous, and I can't remember his name. He's brought the game, in all the CIA's restaurants up to a very high level. I ordered Mont Blanc - one of my all-time favorite desserts. I was not disappointed with what I was served - but it wasn't a classic Mont Blanc which is a meringue filled with chestnut puree and topped with whipped cream. My dessert was a little chestnut-swirled hut, sitting on a pound cake foundation, filled with black currants and decorated with meringue sticks - a scoop of cassis ice cream sat beside it. Very nice. Marissa had cheese cake - details not noted, by me. Guess from the photo. Tasted good too. I buttered a roll and asked the staff to wrap it up for me to bring to Allegra. They did and graciously added a few extra rolls to the package. The whole Bocuse experience was delicious, and a delight. One that I recommend. Allegra's patience was rewarded with a buttered roll, and a chance to dash around the CIA soccer field. She completely forgot that she had waited for me in the car. Why did I bring her along? For the company. By the time we drove back to Hudson the only sign of snow was on the ground - the road was clear. Mark Twain famously said about the weather in New England, "If you don't like it, just wait a few minutes." He could have been talking about this part of New York State. On Saturday, March 16th, Chris Jones and I are hosting a cocktail party, benefit, to give all the children in the Hudson City School district an opportunity to attend the May 4th Book Festival AND have the means to buy an autographed book from one of their favorite authors. Come to The Red Barn on route 9H in Ghent, 5 - 7pm for a drink, some really good snacks, and music. A donation of $25.00 is requested. I got a little side-tracked by a middle-of-the-week trip to NYC to see the carefully curated Matisse show at the Metropolitan Museum of Art. Then I was so, well, so drunk - no, maybe feeling a little off-balance by the exhibit that takes you on a chronological tightrope through the artist's oeuvres. 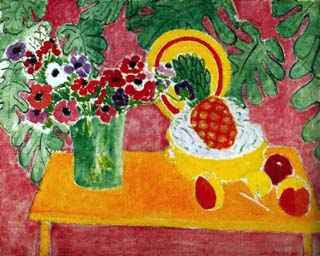 Matisse was thoughtful, he was obsessed. He was the real deal - an artist that so many aspire to, but can't be because of demon impatience. Just think, there was an entire gallery in the museum devoted to the numerous versions of a seated model who he painted her over and over and over again, in the same position, until it satisfied him. During his seven decade career (he was "painting" , in bed, with scissor cut-outs, two days before he died) he was ridiculed, then accepted - he was called fauve, wild beast, by French art critics - but prevailed in spite of it - or, because of it. For some time, he lived in a villa called La Reve - The Dream, in the South of France. It's interior was filled with fabric, souvenirs of his travels through North Africa, gold fish, and flowers; and its exterior, planted with the lush, and fragrant plants that grow in shades of green profusion, fueled his dreams. Matisse's non-stop way of working is what makes cooks become chefs. They make a dish over and over and over again - trying it a few different ways - until it's just right. They concentrate, and are disciplined. I'm a good cook, however, my non-stop thoughts are usually reserved for the space where I am, where I live - the background to my life. Matisse believed that "a picture is formed by a combination of surfaces, differently colored which result in the creation of an expression." He was just as concerned with the background as the apples in the foreground. The details make the picture complete. And so it is. The little house where I now live has several little rooms - it was a small two-family house when I bought it. I knocked down a few walls, demolished the upstairs kitchen and painted the walls comfortable colors; warm in the rooms where people gather for a chat, and eat, and cool in the sleeping, and thinking areas. The kitchen is painted a color that I refer to as Majorelle blue. It's the purple-ish, cobalt blue that dominates the Majorelle gardens in Marrakech. I think blue and food are good together. Because there are little rooms off other little rooms I've been able to not only create a rather spacious off-the-kitchen pantry, but also a comfortable walk-in closet off my bedroom. I call the ingredient-filled pantry, my bodega. I was able to put the rerigerator in the pantry too - an idea completely inspired by a friend's beach house arrangement. I think that the refrigerator is quite possibly the most cumbersome appliance in a kitchen. Happy to have it out-of-sight. This means that the kitchen, is like a working-sitting room with pictures on the walls - because there are no cabinets (except for an old Hudson Valley, step-back cupboard) - a work table, straight out of mechanic's shop; one of Brooke Astor's old chairs bought at a local auction house; a stainless steel trolley from my old NYC catering kitchen filled with, baskets, trays, plants and flowers (and a food processor); a peg-board, alla Julia Child, for some of my pots and pans (the ones I use most frequently); and a door to an enclosed back porch. A rather dreamy situation, and one that I have been imagining for awhile. All of this is my way of saying that I didn't do much cooking this week. I did cut up some tropical fruits; pineapple, mango, and papaya to eat in morning with granola and local sheep's milk yogurt, or spice up and eat with a piece of pan-fried halibut. I coated the halibut in a mixure of breadcrumbs, hot pepper flakes and salt, and pan-fried two pieces in butter browned in a bit of olive oil. About 90 seconds on each side - halibut is thick. I served it with the tropical fruits , fresh parsley and a generous douse of fresh lime juice. SUSANSIMONSAYS: Sorry to say that my new newspaper column still isn't available online: www.registerstar.com I'll let you know when it appears. This Thursday, March 7th, I am starting a monthly radio segment (listen for it the first Thursday of every month), "How to Build a Pantry" , at 4:30 pm with Ellen Thurston on her afternoon show - it can be streamed live at www.wgxc.org. I'm excited to be returning to the C.I.A. this Friday to have lunch at the new Bocuse Restaurant. Next blog will have details.